In a recent article, I offered a discussion of the U.S. 3-cent Liberty “rainbow” essay experimental stamp designed to prevent reuse of cancelled stamps. 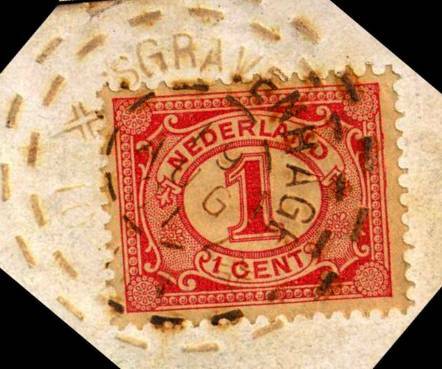 An equally unique strategy to prevent the illegal reuse of stamps was an experiment by the Dutch postal service to burn a cancellation impression onto the stamp. Unfortunately, more was burned than the stamp and the experiment was quickly abandoned. 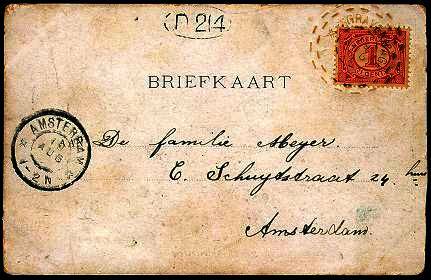 In 1900, the Dutch PTT (renamed TPGPOST in May, 2002) asked an engineer from The Hague, Mr. C. C. van der Valk, to construct a machine that could burn a postmark impression onto stamps that were affixed to postcards and envelopes. 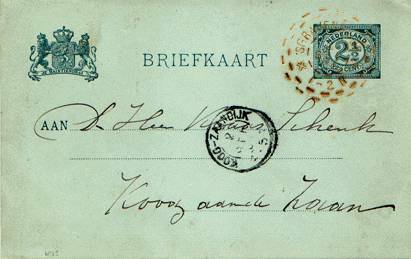 A year later, C. C. van der Valk delivered a machine that worked with a heated postmark. 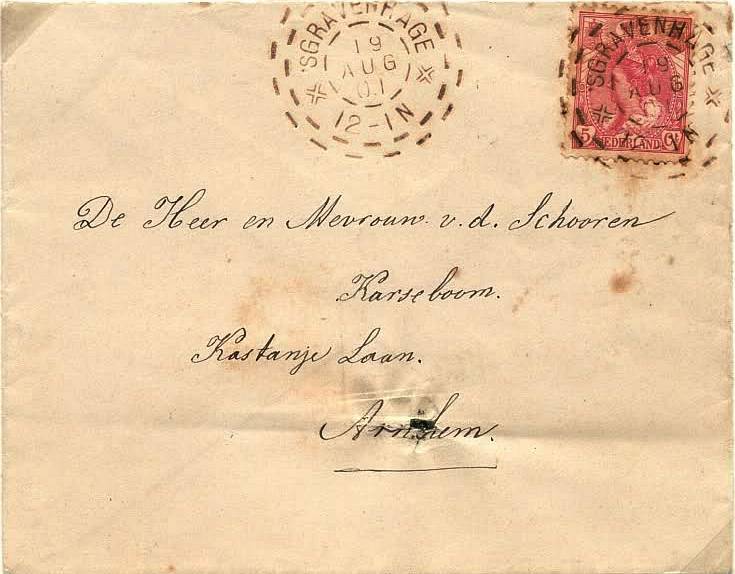 As electricity was not common at the post offices at that time, the Vulcanus machine, as van der Valk called his device, used a kerosene flame to heat the postmark. The kerosene reservoir was placed above and away from the cancelling machine and the flame was fed by the kerosene through a thin pipe. As can be seen in the above photo, the machine was operated by a foot pedal and a skilled postman could cancel as many as 240 letters and/or postcards per minute. The August 19, 1901 strikes applied to the cover shown above are excellent examples of the Vulcanus burn cancellation. 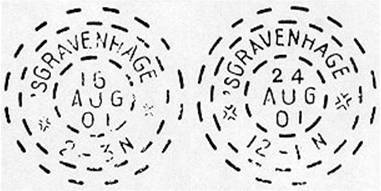 The machine was used only in 's-Gravenhage (The Hague) beginning on August 3, 1901. The first known and recorded cancellation is from August 5. Cancellations of the Vulcanus machine can be identified by the three broken circles and the red-brown burned imprints. The burnt-in-cancellation exists in two types with relatively small differences. But the use of the Vulcanus machine was short-lived. As one can imagine, there were serious problems with the machine as it not only burned an impression in the stamps but sometimes also left burn marks on, or even destroyed, the content of the letters. As such, the trial period for the use on letters ended on September 29, 1901. 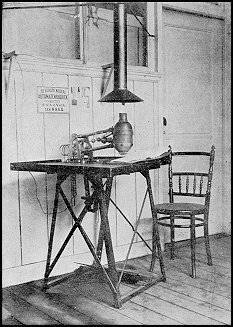 The Vulcanus machine continued to be used for postcards and printed matters until November 2, 1901 when the device was officially declared a failure and removed from service.